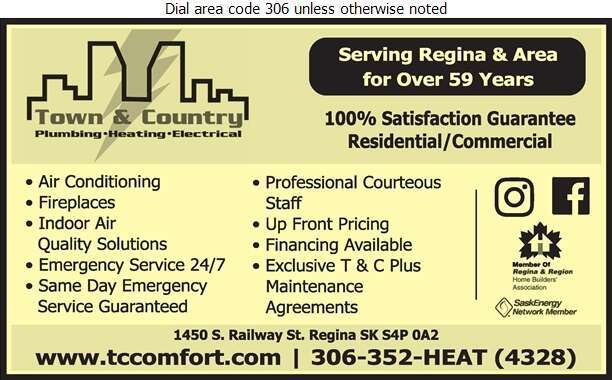 Town & Country is a family owned and operated business established in Regina, Saskatchewan in 1963. In the past 47 years, Town & Country has expanded to accommodate the growing community and currently supports a workforce of over 100 employees. We are continually upgrading and educating our staff through training courses and manufacturer correspondence to ensure we are supplying the best products and knowledge to all customers. Our professional and courteous staff give up front pricing and have financing available for your convenience. 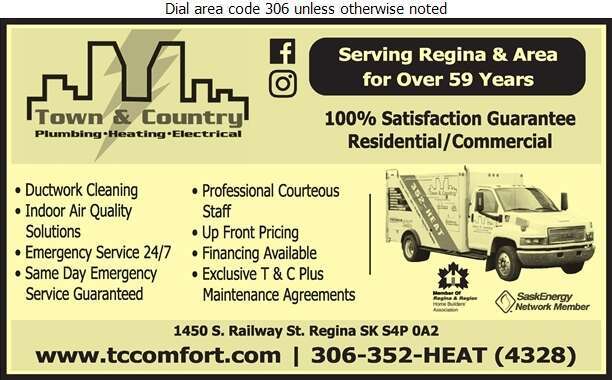 We are your full-service plumbing, heating, electrical & air-conditioning contractor with the ability to service or install complete systems and provide same day emergency service 24 hours a day, 7 days a week guaranteed. Visit Our Showroom today! These guys are great. They were able to fit me in when my other plumber stood me up. They were courteous and did a great job. Would recommend highly. We"ve hired Town and Country 3 times, twice for plumbiing issues and once for an emergency furnace problem. Each time they have been prompt, very courteous and have endeavoured to save us money by working quickly and using generic parts where possible. We would highly recommend them. I recommend Town and Country Plumbing and Heating because of their excellent service. I started with them a couple of years ago when the guys in the green van who installed our energy efficient service couldn't come out and repair it for several weeks, even though it was getting cold. 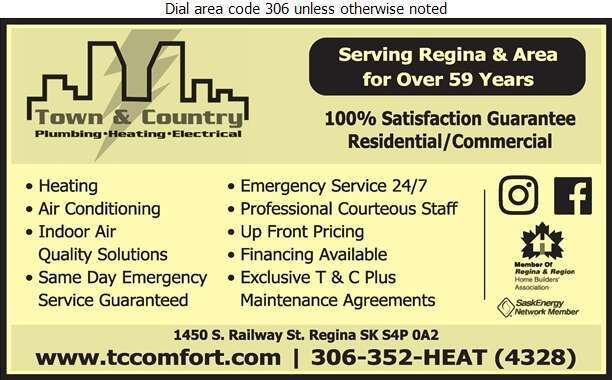 T&C had someone out within a few hours and I have since had a maintenance agreement with them that provides for them to come out twice a year to service the furnace and A/C. Our furnace quit on Sunday and the technician patiently talked me through getting it temporarily up and running, saving me several hundred dollars in emergency call out fees. This is a real good company all around. I recommend Town and Country Plumbing and Heating because they have very knowledgeable and courteous technicians, plumbers, sales representatives and office staff to help with any problem you might have.